A neat gaming project is going on thanks to the folks at the MIT Artificial Intelligence (AI) Lab. 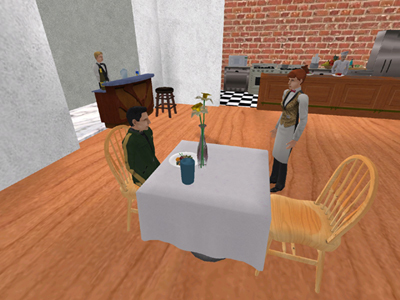 The plan is to get people to play a game based on a restaurant interaction, then by processing the collected gameplay data and processing it through some magic-like algorithm, come up with game behavior that will better mimic human response. Contribute to the first collaboratively authored computer game and earn Game Designer credit! The Restaurant Game takes about 10 minutes to play. It is a two-player game that will automatically find partners for players once you join a server. You are welcome encouraged to play multiple times. In order for this project to be at all successful, we will need to collect a lot of data — data from over 1,000 10,000 gameplay sessions. Play early, play often, and please spread the word! Previous Previous post: The greatest mobile phone review?